Bethans offers an upmarket accommodation for a couple that can share or for a single person in the quiet and safe suburb, Heather Park, in George. Therefore the accommodation is ideal for business accommodation, golf excursions, hospital appointments and holidaying in the Southern Cape. 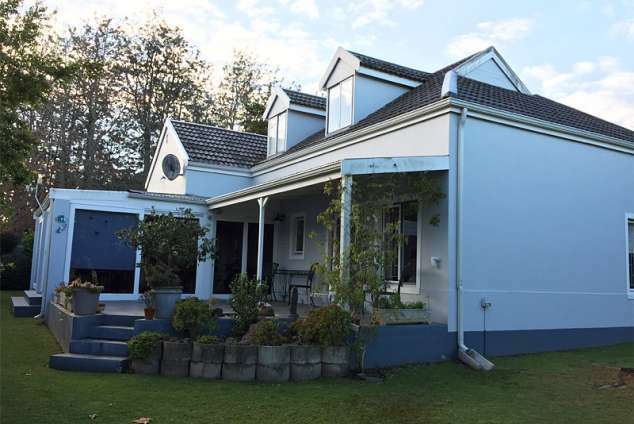 The room, even though part of the house, has a separate entrance from a sunny stoep with views of the Outeniqua mountains, with en suite bathroom consisting of a large shower, wash basin and lavatory. The bed is queen size and the room has ample hanging and shelving space inside cupboards. Included in the room is a fridge, microwave, kettle, toaster, basic cutlery and crockery, coffee, tea, rusks and a basic breakfast consisting of bread (such as home made muffins, croissants, etc. ), yoghurt, cereals, fruit, cold meats, cheese and jam. In sunny weather you can enjoy your breakfast outside on the stoep, or on the enclosed sunroom. There is a flat screen TV with DSTV channels and free wifi internet access. On prior arrangement and at a small appropriate fee, airport shuttles, other shuttles, washing of laundry, full breakfast can be provided. Heather Park is situated close to all George hospitals, airport, golf courses, beach destinations, many speciality restaurants, sightseeing destinations, just over the mountain into the small Karoo including the Klein Karoo Nasionale Kunstefees in Oudtshoorn that takes place in April. 357 page views since 29 Aug, 2018.